Cindy Trimm: "What Have You Put Out in The Atmosphere?" What Cindy Trimm shares here is a great reminder that life and death are in the power of the tongue: "The power of the spoken word is one of life's greatest mysteries. All that you will ever be or accomplish hinges on how you choose to govern what comes out of your mouth. By what you allow to occupy your mind and mouth, you can either bless your life to great heights of success or send it orbiting into realms of failure, sadness, and discontentment." This is a good word to remember and live by! Your Words Can (And Do) Change Other People's Environment! "What Have You Put Out in The Atmosphere?" Everything in the universe begins with and revolves around two things: words and thoughts. These two elements are divine gifts created by God and given to man. They form the creative substance that molds and shapes the destiny of humanity. Each of us becomes the person we are, chooses the direction we take, and accomplishes everything we do based on these two primary elements. Just as in every seed, there is life-giving power that resides in every spoken word. This principle illustrates how the spiritual law of incubation and manifestation works. Everything you see in the natural began as a spiritual seed—that is, as a thought. We are told in 2 Peter 1:3-4 that God, in His infinite wisdom, has already given us all things pertaining to life (the Wycliffe version says, "all things of His God-like virtue") that we might partake of His divine nature. Included in this celestial equipping are divine thoughts and inspired words. As a spiritual being created in the image of God (see Genesis 1:26) your spiritual genes hold the creative power to frame your personal world by the thoughts and words you think and speak, which are divine tools given for your creative use. All you are, experience, and ultimately achieve can be traced back to how you have made use of these two simple, yet vastly powerful, tools—your words and thoughts. The power of the spoken word is one of life's greatest mysteries. All that you will ever be or accomplish hinges on how you choose to govern what comes out of your mouth. By what you allow to occupy your mind and mouth, you can either bless your life to great heights of success or send it orbiting into realms of failure, sadness, and discontentment. This is why Proverbs tells us, "For as he thinks in his heart, so is he" (Proverbs 23:7), and urges, "Guard your heart above all else, for it determines the course of your life" (Proverbs 4:23). Jesus followed suit by declaring, "For whatever is in your heart determines what you say. A good person produces good things from the treasury of a good heart, and an evil person produces evil things from the treasury of an evil heart" (Matthew 12:34-35). What occupies your mind determines what eventually fills your mouth; your outer world showcases all that has dominated—and at times subjugated—your inner world. Because the law of cause and effect is continually at work, there is always an inner cause for every outer effect. Your outer world is a direct result of your inner world. Every circumstance in life is a result of a choice—and every choice is the result of a thought. All those things that fill your mind hold the keys to your reality. Your thoughts provide the fuel for your words, and your words provide the fuel for your world. It is paramount that you become the master of your thoughts. The greatest man has become so by the scrupulous attention he gives to controlling what goes into his mind and what comes out of his mouth. So, "Be careful for nothing; but in every thing by prayer and supplication with thanksgiving let your requests be made known unto God. And the peace of God, which passeth all understanding, shall keep your hearts and minds through Christ Jesus. "Finally, brethren, whatsoever things are true, whatsoever things are honest, whatsoever things are just, whatsoever things are pure, whatsoever things are lovely, whatsoever things are of good report; if there be any virtue, and if there be any praise, think on these things" (Philippians 4:6-8). About Cindy Trimm: Dr. Cindy Trimm has given her life to instructing and activating persons in the atomic power of prayer and equipping nations to pursue destiny. She is a 21st Century leader who has partnered with heads of state, business moguls, politicians, church, civic and world leaders for more than 30 years to equip and empower millions to maximize their potential. Her track record as a revolutionary thinker and prolific communicator has established her as a well-respected and sought-after leader in the world today. She founded Cindy Trimm International (CTI) to bring practical solutions to spiritual and social ills; effecting change within our communities while transforming the course of our global destiny. 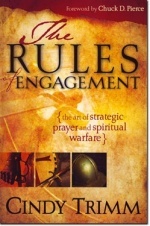 Dr. Trimm is best known as the General in the Art of Strategic Prayer and Spiritual Warfare, Kingdom Practitioner and is a respected prophetic voice, bestselling author, life coach, and Ambassador of Hope. She is the author of: The Rules of Engagement and Commanding Your Morning books and has been featured on many television, streaming, and radio programs. It is time to take a stand against the powers of satan. Using the authority you have been given by God, you can enter the realm of prayer-power. This teaching by musicologist and physicist David Van Koevering is nothing short of mind bending! You'll hear of why your words change things - just like Solomon stated in Proverbs 18:21, "death and life are in the power of the tongue." You'll also gain potent keys to why and how you can leave blessings wherever you go. This teaching is nothing short of a hearty WOW!